Announced in July, the Surface Go is the first new line of Surface PCs since the Surface Studio was launched in 2016. 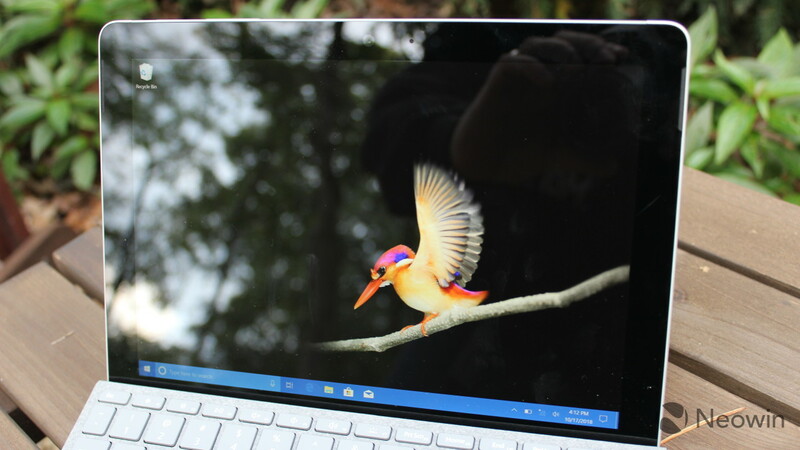 The Surface Go is a 10-inch tablet, and it's almost like a spiritual successor to the Surface 3, the infamous non-Pro Surface line of tablets that first ran the now-defunct Windows RT and was redeemed with an Intel processor in its third iteration. 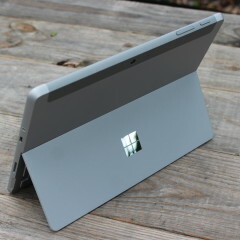 It's definitely the most portable Surface tablet, easy to take on the go (get it?). It's compact, it's light, and it's just comfortable. The Type Cover keyboard is really comfortable as well, and I hope to see future Surface Pro Type Covers adopt the same shallower keys. But the main sacrifice is the performance. Starting at $399, the Surface Go packs an Intel Pentium Gold 4415Y processor, and sadly, that just doesn't cut it. Here's our review. The model that costs $399 comes with 4GB RAM and 64GB eMMC, but there are a total of four consumer models, all of which ship with Windows 10 Home in S mode. There's another with 4GB RAM and a 128GB SSD, and one with 8GB RAM with a 128GB SSD. Finally, there's an LTE model with 8GB RAM and a 128GB SSD. There's also a suite of commercial models that ship with Windows 10 Pro, and that's where you'll find an LTE model with a 256GB SSD. Microsoft sent me the consumer SKU with 8GB RAM and a 128GB SSD. Given the performance limitations of the Pentium Gold processor, you're probably going to want to go for the faster SSD storage, and skip over the base eMMC storage. 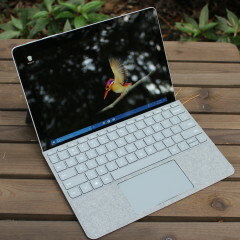 I actually really like the design of the Surface Go. 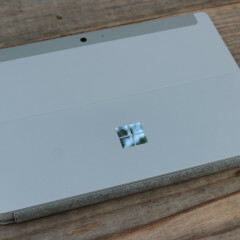 It's almost the Surface Mini that we never got. It's actually compact and light, and the best use I got out of it was when I'd pull it out of my bag to take handwritten notes. It's not just a smaller Surface Pro either; in fact, I'd like to see future Surface Pro models take some design cues from the Go. 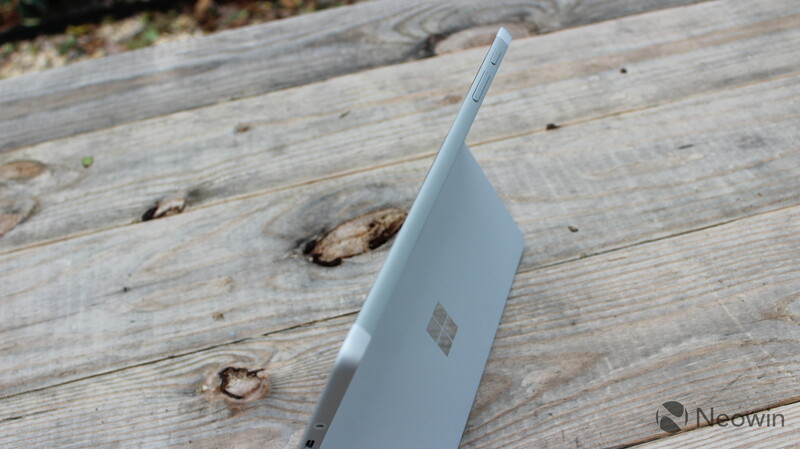 Gone are the sharp corners that we've come to know in Surface tablets, and they've been replaced by more rounded corners. This certainly makes the device more comfortable to hold, and to use as an actual tablet. It feels like a smaller Pro, but more refined. Pretty much everything else is in the same place. Both the power button and the volume rocker are on top, all the way to the left. On the right side of the device, there's a single USB 3.1 Gen 1 Type-C port, a Surface Connect port, and a 3.5mm combo audio jack. 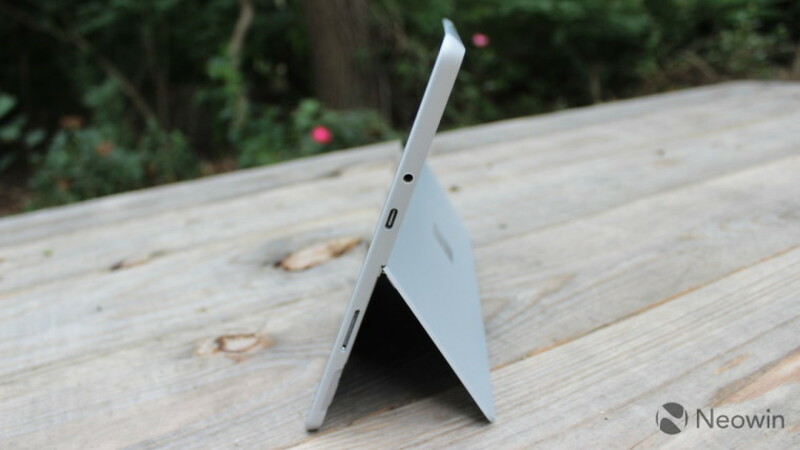 In fact, this is the first Surface device to not include a USB Type-A port. It always kind of disappoints me to see Microsoft clinging to its proprietary Surface Connect port, but the good news is that the USB Type-C port and Surface Connect are on par with each other. Both are USB 3.1 Gen 1, meaning that they support 5Gbps data transfer, and both can be used for charging. There's also a micro-SD card slot that's placed beneath the kickstand. 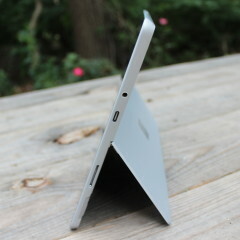 And speaking of the kickstand, it can be used at any angle, making it easy to draw on the device. Microsoft made sure that you can press it down with one finger, a common theme across the Surface lineup, and you'll often see it in advertisements. The firm actually puts a lot of engineering work into the hinges. 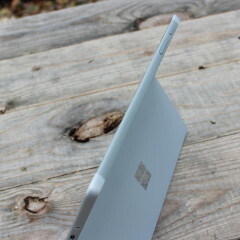 On the back of the kickstand is a chrome-colored Microsoft logo, and at the top of the back of the device, there's a world-facing camera. The Surface Go really is this odd mixture of awesomeness and compromises. The display is definitely part of the awesomeness, as displays are definitely something that Microsoft does well. 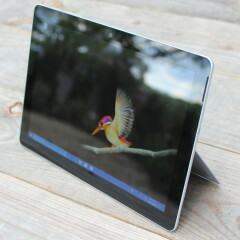 In fact, the 1,800 x 1,200 screen is probably the best that you're going to get in a PC that starts at $399. As is the case with most other Surfaces, and all modern Surfaces, it has a 3:2 aspect ratio. This is certainly worth noting, since it's a tablet. 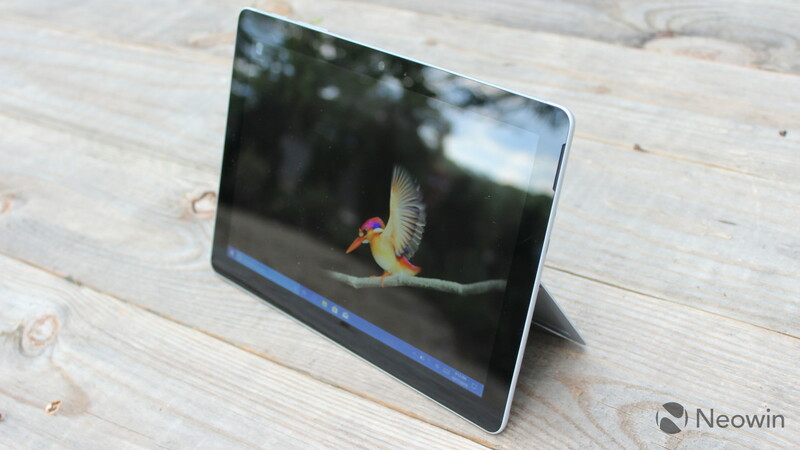 In fact, given the size, you might even be primarily using it as a tablet, something that probably can't be said for the Surface Pro. 3:2 makes the screen a bit taller than you'd find on a 16:9 screen, which is more standard in laptops. This makes it adapt to a portrait orientation better. You'll notice that the wallpaper in the image above has a black background, and I kept that background on purpose. Being that the Surface Go, like the vast majority of PCs, uses an LCD, or liquid crystal display. It's backlit, and that's why you can easily see where the display ends and the bezels begin. It's not too noticeable though, and that's one way you can tell that it's a good LCD panel. The closer it is to true black, the less washed out colors will look when rendered on top of it. You can view the display at any angle, as it supports a full 178 degrees from all sides. Unfortunately, the Surface Go does have some pretty large bezels, which are quite noticeable in this age of shrinking bezels. 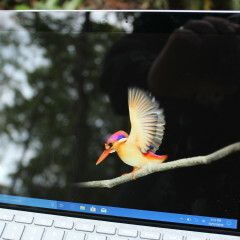 The Surface Go uses an Intel Pentium Gold 4415Y processor, which is from the Kaby Lake family. It's a dual-core chip with four threads, and it has a 6W TDP. You can think of it as almost a seventh-generation Core m3, but lower end. I really don't want to get into the specs of the chip too much, because they really don't matter. The truth is that the performance is just not enough on the Surface Go, and the lag is noticeable when performing most tasks. If you get a Surface Go even as a supplemental machine, you'll notice that everything takes longer, even opening basic apps like Settings. The thing is, there are better and more powerful laptops for the price, and there are better and more powerful tablets for the price. I'm really not sure where the Surface Go is aimed at, and it feels like the Pentium Gold is the Achilles' heel of this tablet. I also want to address the fact that Microsoft didn't use a Snapdragon processor in this machine. There were some reports that Microsoft was going to go with Qualcomm, but Intel made an offer that Microsoft couldn't refuse. I don't believe these reports, as the Snapdragon 835 was the only ARM chip available at the time, and it was awful. In fact, the Snapdragon 835 was really only meant to be a starting point for Windows on ARM; there was never going to be any Surface hardware that included it. It would have been far worse than the Pentium Gold. And don't get me wrong. The Surface Go isn't unusable by any means. It's just not good in terms of performance. For benchmarks, I used PCMark 8, which offers three tests: Home, Creative, and Work. First up is Home, which tests common tasks like web browsing, video chat, casual gaming, and more. As you can see, the results are mediocre at best. Next up is the Creative test, which checks GPU-intensive tasks like video editing and mainstream gaming. Finally, the Work test checks productivity-related tasks like writing and spreadsheets. As you can see, the Surface Go doesn't test particularly well in any area. It doesn't do well in battery life either. Microsoft promises up to nine hours of battery life, which means that in reality under real-world use cases, you'll get four or five hours. 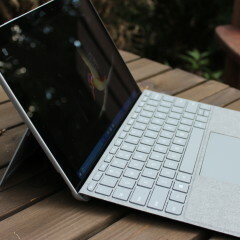 As I've noted, I'm a bit confused at who the Surface Go is aimed at. For me, it's way too small to use as a laptop. Even an 11.6-inch display would be too small for me, and those are 16:9, so they're wider. This is 10 inches and 3:2, so it's small. 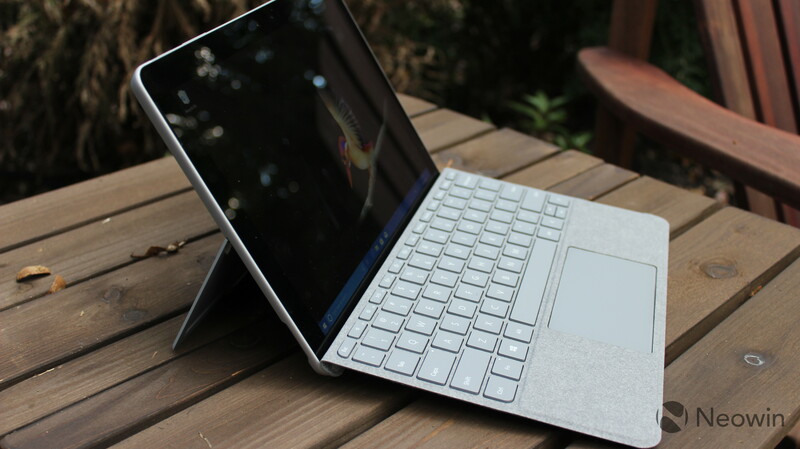 If a Surface Pro is a laptop first and a tablet second, I'd feel like the Surface Go should be a tablet first and a laptop second, although Microsoft is still branding this as a laptop for whatever reason. This might have something to do with how terrible Windows 10 is as a touch-first, tablet OS. Pen support, or Windows Ink, or inking, or whatever they're calling it today, is fantastic, and it's probably unparalleled from other platforms. But as far as being a touch-first tablet OS, Windows 10 is just bad. For example, tapping on a text box may or may not open the onscreen keyboard. If it doesn't, you can manually open it from the taskbar. On iOS and Android, this experience is seamless. When you put Windows 10 into tablet mode, the tiles on your Start Menu go fullscreen, so if you don't use Live Tiles in your Start Menu, you actually just get a blank Start Menu in tablet mode. Again, when compared to competitors, this is not good. On top of all of that, the apps don't measure up. The Netflix and Hulu apps are there, but they're just wrapped web apps, so they're a little clunky compared to the native apps on competing platforms. What's more bothersome to me is that Microsoft has done almost nothing to improve this experience since Windows 10 launched. Despite the fact that the Surface Pro is by far the most popular Surface and that the company clearly wants to push Windows 10 on tablets, nothing has been done to make the experience better. One thing that Microsoft has definitely invested in is Windows Ink, and if you definitely plan on using the Surface Pen most of the time, Windows 10 is great. For me, I like to take handwritten notes in OneNote, but Windows Ink can do so much more. You can use it to draw a line between two spots in Maps and it will make you a route. You can mark up PDFs in Edge, so instead of having to print out a document, signing it, and scanning it, you can simply sign it and save it. You can write on images in the Photos app, or you can draw in the Ink Workspace. There's plenty to do with Windows Ink, but for an overall tablet experience, I don't know why someone wouldn't just buy a $329 iPad, which now supports the Apple Pencil. 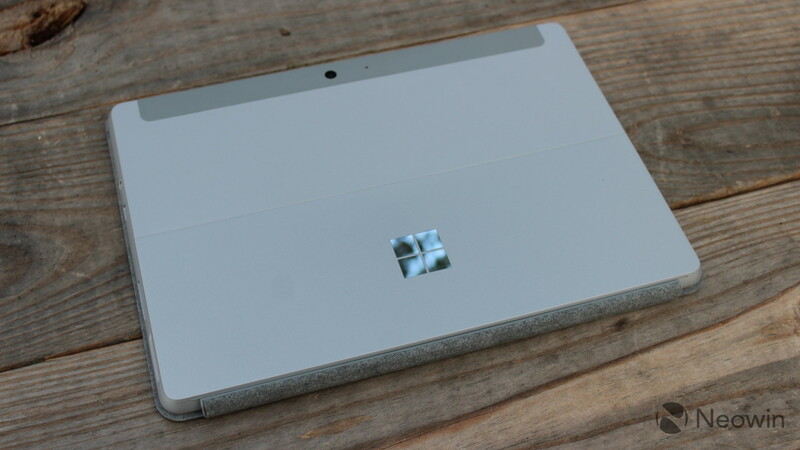 The Surface Go Type Cover costs a bit less than one for a Surface Pro, mainly because it's smaller. The black one comes in at $99, or you can get an Alcantara fabric one for $129. Also, if you're putting together the whole package, the Surface Pen is also $99. I really like the feel of the new Surface Go Type Cover. 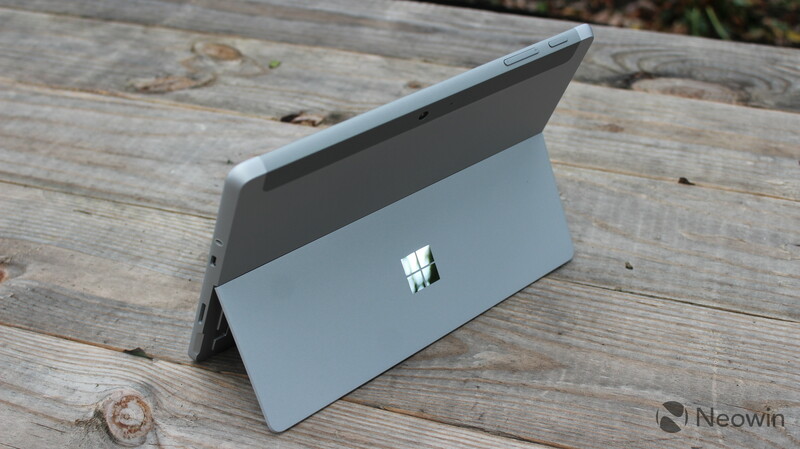 It feels sturdier than the ones for the Surface Pro, and that's a good thing. The keys are definitely more shallow, and that means you're not hitting the keys as hard, so it doesn't rattle as much. Ultimately, I think it's a bit too small to type comfortably on, at least on a regular basis. That's why I think that the Surface Go works more as a tablet that you can occasionally use as a laptop, if only Windows 10 wasn't so bad as a tablet operating system. I put Windows Hello and general build quality in the same category because both of these things matter when considering the price of the Surface Go. The device does have an IR camera for facial recognition, which is really rare for a PC at this price point. I think that facial recognition is the way to go when it comes to Windows Hello. It's just natural to sit in front of a PC and have it recognize you and log you in. If you're lucky, you might find a PC at this price point that gives you a fingerprint reader, but you might not find an IR camera. Now, find a PC that's made of magnesium, has a 1,800 x 1,200 PixelSense display, and has an IR camera for facial recognition. There are definitely some premium elements of the Surface Go, and those are worth noting. While Windows 10 doesn't work well on tablets, I want to use it as a tablet. When I have it in my bag, I enjoy taking it out and writing notes on it. I wish I had more of a use for it, because the materials just make it so comfortable to use. And when I say the price point, I'm including the $549 price point of the higher end model, which is the one I've been using. After all, I certainly wouldn't recommend the 64GB model that costs $399, as the eMMC storage will just add to the performance woes. 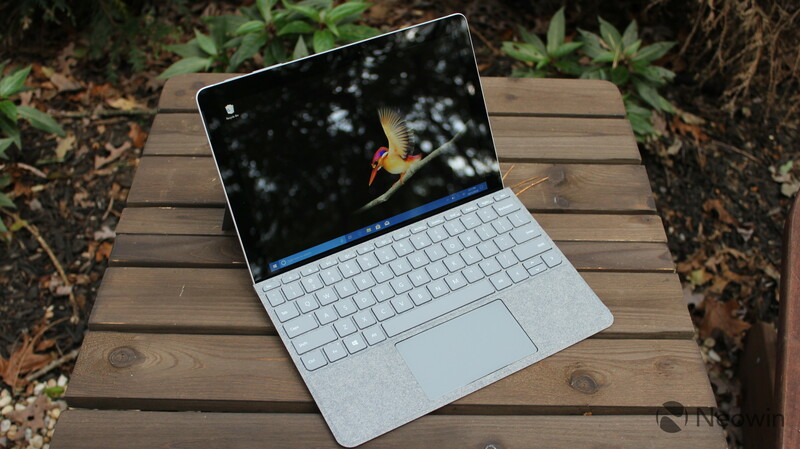 As I mentioned, the Surface Go is this mixed bag of really good things and really bad things, and I think that you have to be a very specific type of consumer for the good things to outweigh the bad. The bad is poor performance, poor battery life, and Windows 10 on tablets. The good is that it has a premium build, a nice display, an IR camera for Windows Hello, and it's great to use with Windows Ink. It's great for taking on the go, and if you do buy a Surface Go, you might want to get the 4G LTE model, so you can take it with you without worrying about connectivity. At the end of the day though, I can't figure out why I'd recommend the Surface Go instead of an iPad. Apple's cheapest iPad costs $70 less than a Surface Go, it's faster, it's a more seamless tablet experience, and it supports the Apple Pencil, which costs the same as a Surface Pen. One might argue that an iPad can't run the "full" apps that Windows can, but I don't think the Surface Go can run those apps with its Pentium Gold processor, if we're talking about the power-hungry apps that aren't available on a mobile OS.